First things first: My Acer Cardigan is finished, blocked, and dry, but alas, we are in the middle of a particularly stormy April here, so I am waiting for the sun to come out again for a proper photo shoot. The forecast is looking promising for this Saturday, so watch this space. Now that I finished the sweater -- a full two weeks ahead of my self-imposed deadline of Maryland Sheep and Wool -- I'm not feeling any real pressure, but I did feel the urge to cast on for something new. I've had my eye on the Essential Cardigan from last summer's Interweave Knits since the issue arrived in my mailbox. It's a really classic, versatile sweater, and I knew that in the right yarn it could be a good year-round sweater. As it happened, I was pretty sure I had a suitable yarn in my stash already, and that's how I came to liberate some very well marinated Elsebeth Lavold Silky Tweed from my fiber room. I swatched it up on Sunday and it came out just as I wanted it to -- soft, silky, and drapey. It's hard to capture the texture and depth of this yarn (especially in this lack-of-sun light). At first glance, it's a charcoal-y gray, but there are flecks of light blue and white in it as well. My gauge is ever so slightly off (by half a stitch over four inches), but it's actually going to work to my advantage because I am between sizes in the pattern and want a little bit of positive ease. I'm not in any rush to finish this sweater, but it should be a fairly quick knit despite the smaller needles relative to my Acer. With the exception of the ribbing at the hem, cuffs, and around the neckline and button bands, it's all stockinette -- I can do that in my sleep! I think this should make some very good car knitting for the drive to Maryland! I haven't posted about my Acer Cardigan in a while because it went into brief (and probably undeserved) hibernation. I was about halfway through the increases on the second sleeve while knitting at my LYS when my friend, who is also the store manager, asked me if I would mind knitting a sample for the shop. It was just a simple ribbed scarf, and would be a short one at that, so I of course said yes. It took me maybe a week to knit the thing, which isn't bad at all considering how much I usually loathe knitting scarves, but that meant that the sleeve was ignored until the scarf was done. 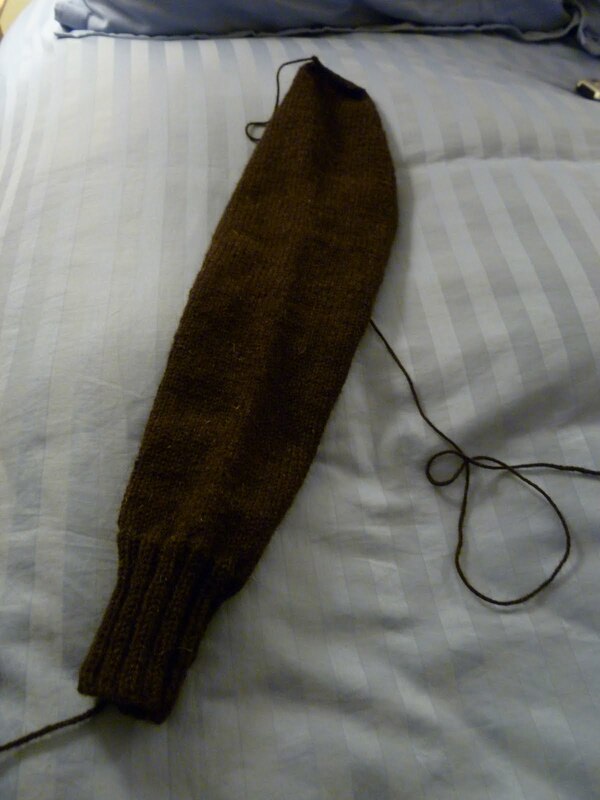 Fortunately, once the sample knitting was done, I was able to make fast work of that sleeve. I finished up the sleeve cap and bound off last night at Hurricane Knitting. I had already done the three-needle bind off on the shoulders when I finished the body, so once the sleeve was done, the next step was to start in the button bands. Picking up stitches for button bands and collars and things always makes me a bit nuts because I can never seem to pick up the right number. This time around, I decided to be a little logical about how I was going to do it, especially because my row gauge was a little off and I knew I'd have to pick up more stitches than specified. The ratio of stitches to rows in this pattern's gauge was about 7 to 10, so I rounded that a bit and decided to pick up about three stitches for every four rows. I also took into account the pattern for the button band, which is in a 2x2 rib with an extra stitch at the bottom and two extra stitches at the top -- or, in other words, a multiple of 4 plus 3. I figured I could follow my 3 stitches for every 4 rows guideline and fudge it a bit if I had to to get a multiple of 4 plus 3. I picked up all the stitches according to this plan and was pleased that I ended up picking up the first three stitches and also the last three without trying (I really don't like it when my button band doesn't line up with, say, the cast on edge of the sweater). Then I counted the stitches, figuring I could undo a handful and pick up fewer or more to get a number that would work, and was amazed when I came up with 99 -- a multiple of 4 plus 3! It's a bit more than the recommended number for my size (which I think was about 83), but it looked just fine. Moreover, because I picked up exactly three stitches for every four rows, I know I can replicate it for the second button band. This was clearly the extent of my knitting good luck for the night, because after finishing three rows before we were kicked out* of Barnes & Noble, I discovered that I had neglected to go down a needle size for the ribbing. So, as soon as I got home last night, I ripped back to the picked up stitches and started again with my size 5s. I managed to get the whole band knit and began the bind off while watching the hockey game (though I put it away and went to bed after the first overtime), so I should be able to finish it and get a good start on the other one tonight. Once the button bands and collar are done, I'll have to face the music and set in the sleeves -- I'm saving it until the end mostly because I always have trouble sewing in set-in sleeves, and this is the first time I'll have to do it in the round -- and find some buttons. I am guessing I will have this done by the end of the month, so now I just have to hope that it's cool enough in Maryland to wear it at least once! *Only because the store was closing -- we were actually on pretty good behavior last night. I celebrated a pretty big birthday last month and, after several months of talking about it, I decided it was time to add another addition to our family. What, you were expecting a pet or another baby? No way -- at least not yet (I have to work on The Mister with regard to both). No, the latest addition is a fancy shmancy new piece of spinning equipment, a HansenCrafts miniSpinner. This is an electric spinner; I hesitate to call it a wheel, because it doesn't have one. Instead of using a drive wheel and treadles to power it, it has a motor that turns the flyer. A dial at the front controls the rate of speed and, thus, the ratios, meaning that how fast I spin is no longer dependent on the ratio of my whorls or how fast I can move my feet. This e-spinner also has something my Lendrum doesn't -- a WooLee Winder. For those of you who may be unfamiliar with this piece of equipment, it's basically a mechanism that automatically moves the yarn guide up and down the length of the bobbin, meaning the yarn winds on really evenly and, as a result, more fits on the bobbin. I didn't see a need to get one of these for my Lendrum, because it has a sliding yarn guide and I'm a certified Obsessive Hook Slider (i.e., I don't mind stopping while spinning to move the yarn guide a little at a time). However, the main advantage of an electric spinner like this is that you can keep the speed constant, which would make stopping to move the yarn guide kind of counterproductive. I did a bit of practice on the new spinner with the fiber that was included with it, but I've got two full bobbins ready to be plied into laceweight! Do you remember the Monkey socks I knit from Colinette Jitterbug three years ago? If not, I can tell you that I enjoyed the yarn while I knit with it and loved the resulting socks, but I was a bit disappointed with the yardage in the skein as well as with some knots. We have a sleeve! Finished at knit night last night and it fits perfectly. Would you like to admire my sleeve cap shaping? Of course you would. The second sleeve will be cast on this evening and I anticipate a matching pair in another week or so! Little progress has been made on my alpaca/merino/silk since last you saw it; I'm hoping to be a little more productive this week. Today I finally got a chance to photograph some fiber that's up next in the spinning queue -- the most recent shipments from the Crown Mountain Farms fiber club. March's shipment was Coopworth in a colorway called Hittite Kingdom. This fiber is new to me. It's not the softest of fiber, but it has a nice sproing to it. I'm envisioning this as a thicker (worsted-ish) two ply. I think this would make some really nice mittens. April's fiber arrived just a couple of days ago. This is Border Leicester, also new to me, in a colorway called Clapping with One Hand. This fiber is silky and wavy rather than crimpy. I get the sense that it will have great shine when spun up. This is likely also to be a two ply, perhaps a sport or DK-ish weight. I'm excited to spin these fibers up, so I'm hoping that will give me the kick I need to finish the laceweight!